Typically in our offices we try not to recommend specific brands of models of footwear as being superior one versus the other. Winter however bring even greater challenges for those searching for stable footwear the will provide both warmth and water resistance. Over the last 15 years at least, my personal go too for winter wear has been a relatively obscure brand from the land down under, namely Blundstones. In more recent times we have used their footwear to clad our two growing boys during the messy colder month, and both of them benefit from the additional control and the space to accommodate their relatively bulk functional orthotic devices. Alas when it comes to foot structure, as so often happens, the apples did not fall far from the parental/Podiatric tree. Here is a link to the companies web site, as always you need to try the footwear on to make sure it comfortable and suitable for your foot before buying. One style does not fit/suite all. Also beware the sizing is for Aussie/Tassie feet which does differ from our north American sizing system, it’s a bit like our collective use of the English language. 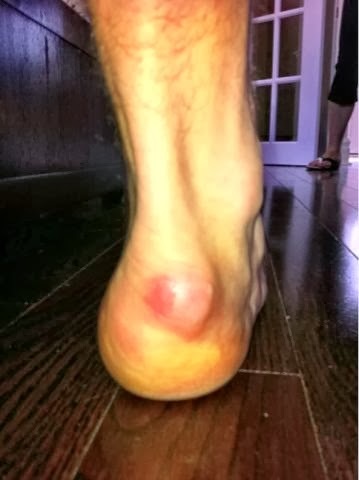 One of the more common hockey related sporting injuries we treat in the practice, is pain in the back of the heel, and is known as a skate bump, Haglund’s deformity, bursitis or tendonitis. The cause of which is most commonly regarded as poorly fitting skates, or poorly finished interiors of the skate. Our findings often times demonstrate that while these may both be contributing factors, the underlying cause is primarily functional instability of the rearfoot within the confines of the near rigid skate form. In both cases of excessive pronation or supination of the rear foot, the resultant calcaneus tilting in or out, produces a number of harmful forces. The Achilles tendon alignment with the posterior aspect of the Calcaneus is most efficient and powerful when parallel. As the angular relationship increases in both conditions so too does the bias in the delivery of the energy. If chronically forced to perform in this manner while contained in the rigid boot, an inflammation of the tendon at its point of attachment will follow. So too will the formation of a protective bursae which could be likened to the deployment of the air bag in your car following a bump. Unlike the cars air bag this fluid filled sack is surrounded with sensory pressure receptors, and will continue to distend itself with subsequent injury. The physical sheering action of the of the tissue, against the boot during the action of repetitive supination or more commonly pronation, contributes massively to the additional inflammation and sensitization of the area. In most cases where the underlying cause of the functional instability can be identified and controlled both on and off the ice, the condition can be alleviated. If not however it can become cripplingly debilitating resulting in chronic bursitis, tendonitis, and retro Calcaneal spur formation, requiring surgical intervention and prolonged abstention from activity.